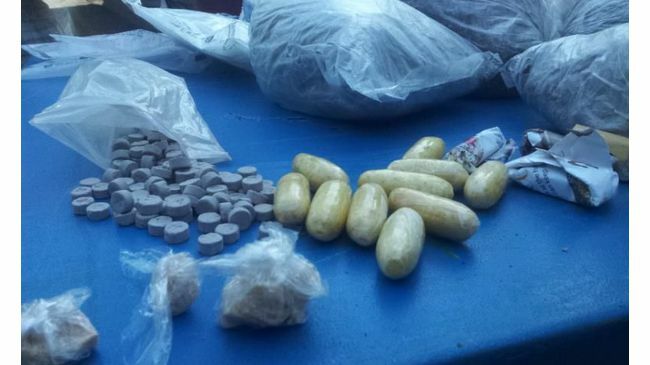 A shocking 40 tons of ephedrine, which is used in the manufacture of the deadly Cape Town tik drug, has made its way into Namibia. Tik has been responsible for a swath of destruction in Cape Flats neighbourhoods, where gang wars and territory battles are being fought daily because of the lucrative trade in the drug. It has also fuelled an associated crime wave, as well as shocking amounts of sexual assaults and rapes. The latest drug stats for Namibia reveal that tik is among the drugs being consumed in the country. During the period 2012 to 2016 a total of 2 147.85 kilograms of dagga as well as 2.25 tons of dagga plants, were seized in Namibia, while 4 821 units of crack and 16 436 mandrax tablets were confiscated. A total of 37 straws of crystal meth (tik) were seized during the period, while police confiscated more than 40 tons of ephedrine, the active ingredient in the deadly tik drug, were seized during the period. This is according to 2018 World Drug Report, which said that in 2016, globally, about 275 million people used drugs. The report further showed that 526.05 grams of cat (methcathinone) was seized in Namibia during the period 2012 to 2016 and 396 ecstasy tablets were also confiscated. With regard to cocaine salts, 7.853 kilograms were seized in the country, as well 75 LSD tablets. The report indicated that in 2016 heroin was seized for the first time in Namibia, with a total of 10 kilogrammes that was confiscated. Meanwhile, statistics released by the Namibian police last week showed that drugs with a street value of more than N$1.8 million were seized in January this year. Police also arrested 68 individuals, which included 63 Namibians, on drug charges. Between 1 and 31 January, the police seized 62.1kg of cannabis, valued at N$1.2 million, and 4 895 mandrax tablets to the value of more than N$587 000 in a number of drug busts. Moreover, the police seized 35 grams of cocaine powder worth N$17 500 and 54 units of crack cocaine, valued at N$5 400. According to the Namibian police of the 68 suspects arrested, 57 were Namibian men and six Namibian women. One Zambian man, one Angolan woman and three Angolan men were also arrested. In December last year, the police seized drugs with an estimated street value of N$4.8 million and arrested 78 suspects. Namibian Sun also reported at the end of last year that cannabis was by far the most consumed illicit drug in Namibia, with 39kg, worth N$1.95 million, confiscated in October last year. The other drug busts for cocaine powder, crack cocaine, mandrax and tik at that time paled in comparison. Drugs with a value of about N$2 million were seized by the police in October last year, while 126 suspects were arrested for drug-related crimes. Statistics showed that 141 mandrax tablets with a street value of N$16 920 were seized during October last year. Police also confiscated 18.8 grams of cocaine powder worth N$9 400 and four units of crack cocaine worth N$4 000. Two straws of tik with a street value of N$1 000 were seized. Although there are no official statistics and information available on the drug use in Namibia, it is a huge problem in the country. One of the reasons there is no information on drug use in Namibia is because of the lack of rehabilitation facilities in the country. Meanwhile, the global drug report said that about 275 million people worldwide, which is roughly 5.6% of the global population aged 15 to 64 years, used drugs at least once during 2016. The actual number of people who use drugs increased by 20 million people from 2015 to 2016. This change is the consequence of an increase in the global number of dagga users. Dagga remains a very popular drug in Namibia, especially among young people, because it is a more affordable drug. “Experts in many countries in Africa and Asia perceived an increase in cannabis use, although there is a lack of information on the extent of drug use based on national surveys in most countries in those two regions and more evidence is needed,” report said. In addition to being the most widely consumed drug worldwide, cannabis continues to be the most widely produced. The report said that about 31 million people who use drugs suffer from drug use disorders, meaning that their drug use is harmful to the point where they may need treatment. Initial estimations suggest that globally 13.8 million young people aged 15 to 16 years used cannabis in the past year. Roughly 450 000 people died as a result of drug use in 2015 and of those deaths (167 750) were directly associated with drug use disorders (mainly overdoses). The rest were indirectly attributable to drug use and included deaths related to HIV and hepatitis C acquired through unsafe injecting practices.